Proprietary Name: Sennosides,docusate Sodium What is the Proprietary Name? 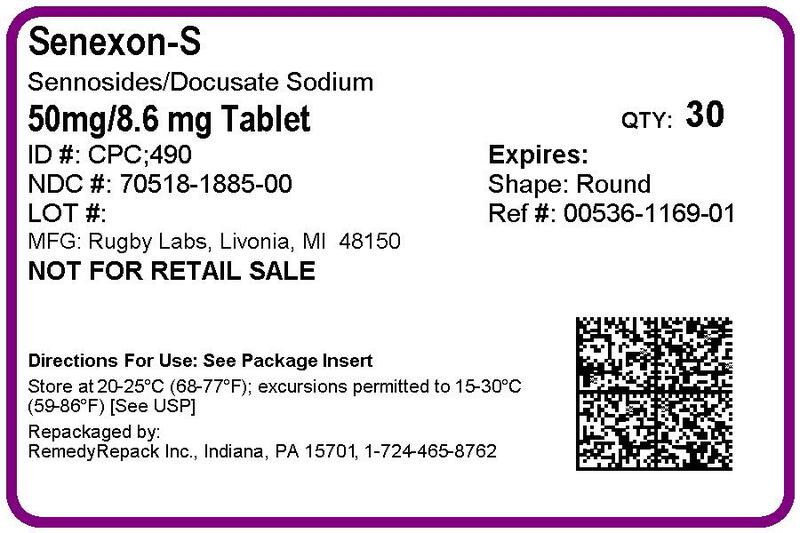 Non-Proprietary Name: Sennosides,docusate Sodium What is the Non-Proprietary Name? Sennosides,docusate Sodium with NDC 70518-1885 is a a human over the counter drug product labeled by Remedyrepack Inc.. The generic name of Sennosides,docusate Sodium is sennosides,docusate sodium. The product's dosage form is tablet, film coated and is administered via oral form. Stop use and ask a doctor if you have rectal bleeding or fail to have a bowel movement after use of a laxative. Croscarmellose sodium, dicalcium phosphate, FD&C yellow #5 lake†, FD&C yellow #6 lake, hypromellose, magnesium stearate, maltodextrin, microcrystalline cellulose, mineral oil, polyethylene glycol, sodium benzoate, sodium lauryl sulfate, starch, stearic acid, talc, titanium dioxide and triacetin†contains FD&C yellow #5 lake (tartrazine) as a color additive.